I wasn’t sure what to call this recipe, because the scribbled notes in my own recipe book say, “Uncle Joe’s Flank Steak”. I got this recipe several years ago from (surprise) my Uncle Joe, after eating it at a bbq at their house and falling in love with it. However I hate it when recipe titles don’t actually describe the flavors in the food. Like, “Oodle doodle bars” or “yummy to my tummy chicken” etc. Why not just say, “Chocolate nut bars with caramel” or “lemon garlic chicken”, ya know? So on that note, I’m going to call this sweet and savory flank steak. I know that doesn’t name the exact flavors in the marinade, but it isn’t one flavor that really stands out, it’s somehow the magical combination of them all together. So sweet and savory tells you it has that awesome sweet/salty combo that is so great on this cut of meat. This is one of our family favorites. Enjoy, and thanks to Uncle Joe! 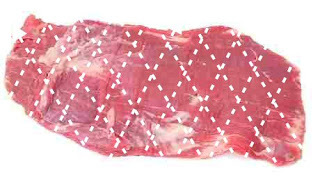 Also, if you’re not used to cooking flank steak- click here to learn more about it. 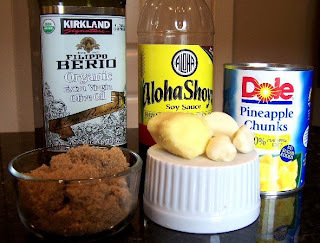 Olive oil, soy sauce, pineapple juice, brown sugar, ginger, and garlic. This recipe calls for pineapple juice, and since I was always left with a can full of the fruit, I came up with this awesome side dish using it and I always serve it with the flank steak. Combine first 6 ingredients for the marinade. Whisk together until combined. Remove 1/4 cup and set aside. Score flank steak with a knife diagonally on both sides. This just means to run a sharp knife through it in the pattern below. You don’t want to actually cut through the steak, just lightly score- like 1/8 inch- into it. This will help tenderize the meat. Place steak in large ziploc bag and pour marinade (excluding the 1/4 C you set aside) over it. Refrigerate 8 hours or overnight. Take out of fridge 30 minutes before grilling. Place steak on grill and cook for 5-10 minutes per side, depending on the size. Use the 1/4 C marinade you set aside to brush over steak in the last few minutes of grilling. (That’s a little trick I use for pretty much any meat that has a marinade just to splash it with an extra punch of flavor at the end) Flank steak should still be pink in the middle when done. *If you don’t have a grill, the other way to cook a flank steak is under the broiler (please don’t anyone just pop it in a frying pan. Not good.) Place on a broiler pan on the upper rack and broil for about 5-10 minutes per side depending on the size. Because this particular marinade has sugar in it, you’ll want to watch carefully so it doesn’t burn. If you see the sugar burning too much, then you might want to move your rack down. I won’t lie, I did overcook the one in the picture a bit- but it’s totally not my fault. My 2 year-old turned off the grill half-way through and I had no idea! So it messed up my timing. Speaking of my two year old, I just have to say, that kids eat this meat like candy; I’ve had more than one person tell me that after getting this recipe from me. Just look at what happened in the 2 minutes while I was trying to take the picture. He got in trouble for trying to grab a piece with his fingers, yet somehow thought I wouldn’t notice if he tried with his face. Finally, a winner. Mmmm…if only you all had scratch and sniff screens. Yum, I really want to eat it just from looking at the pictures! I just bought a new grill (new house needs new grill…makes sense) and this looks like it’s the next thing I’m going to cook on it! I think I’ve been afraid of trying flank steak, but on your recommendation, I’m going to try it out. Thanks! I’ve never purchased flank steak before, but thanks to your yummy recipe, I’m purchasing some on my next shopping trip! 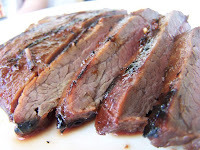 Flank is great…comes in a close second to ribeye…nice thing about flank is that it’s better to marinade than ribeye, so really has a great flavor; esp this recipe! I’m kind of shy when it comes to trying to prepare new meats. . . but I am going to try it because of all of your handy dandy notes. I really appreciate all of the work you guys put into posting a recipe and the tips you give so that we (all of the cooking challenged 🙂 can have a successful experience. I love you guys!! That look so delicious. I was seriously inching my face closer to the screen looking at those pics. I really want to try this because we rarely eat red meat and I always do the same old thing with it when we do. I usually just buy whatever cut is on sale. Question, though: Say *someone* doesn’t really own a grill right now. Will a grill pan suffice? Hey, remember when we had the “Everyone has a sister-in-law named Emily” discussion?? Now I think this should be the “Everyone has an Uncle Joe” discussion! I have a dumb question, Sara. Is there a reason why you cut it before you serve it? Is it so it gets cut with the grain and not against it? I love that pic with T’s face. LOL! Nathaly- I actually meant to add this today, but forgot, I’ll go edit it. If you don’t have a grill, then yes, a grill pan will work, or the other traditional way to cook flank steak is with the broiler. You’ll need a broiler pan though- got one? 🙂 Just put it on the upper rack and broil for 5-10 minutes per side, depending on the size. However, because this particular marinade has a lot of sugar, you’ll want to be careful to watch it under the broiler so the sugar doesn’t burn. Lisa- Ya. Flank steak is a little different than just a normal cut of steak that you serve by itself and let people hack away at. It needs to be sliced across the grain, so it’s just “the norm” to serve it in slices. If you want though, you could just slice a big piece off for yourself and just cut it as you go, as long as you cut it right! Ha ha – I just noticed your kid smelling the meat – Yummy! I’ve never cooked flank steak but you make me want to try. It looks really good! I guess I really am cooking challenged because I don’t own a grill or a broiler pan. I now have two things on my must purchase list for after we move. I just made this tonight. It was awesome. My son said, “This is the best steak I have ever had!” My oldest daughter wanted me to pack the leftovers in her lunch tomorrow, but my son insisted that we keep the leftovers at home to eat for lunch. Needless to say, it was a big hit. The cilantro lime rice was a great side dish, as well. Yum! Tomorrow we are trying the chicken zuchinni pasta. Yum! What is the side dish you usually cook with the steak? We ate this tonight and everyone was WILD for it, the kids were eating like wolves. Everyone said this was the best dinner I have ever made…and I am a good cook! Thank you. This steak is phenomenal! I made it previously and while marinating the flank I decided to thrown in a london broil that I had as well and it too was amazing. I'm going to make it tomorrow for some friends along with the lime-cilantro rice. I also wanted to let you ladies know I love every recipe I try from your site…YUM! I love using flank steak for stir fry beef & broccoli. Nice and tender. We have a BarBQ party coming up at our house. I was going to do another recipe, but I'll try this first and see which one wins with the husband. Hey, question. We have a Weber grill that has three burners. They recommend that you turn off the middle burner and cook with "indirect" heat which is supposed to be kind of like how the heat in an oven circulates. For instance with pork loin or chicken breasts I turn the burners to Medium–Low–Medium or Medium–Off–Medium. Would the cooking time be the same with this cooking method? What temperature of heat do you grill at? Thanks! CJAllred- With pork or chicken, that method works well because it mimics baking- however baking a flank steak would *not* be a good idea! So honestly, I would recommend grilling with direct heat. I would set the heat to medium/medium high. OH SO TASTY! I followed the directions and it came out great. So flavorful, I can't even describe how awesome it tasted. My family is adding this to our weekly dinner plan. Just made this flank steak for the second time…we love, love, love it! It's a total crowd pleaser. The only thing I add is a few teaspoons of red pepper flakes, because I guess we like our flank steak with three S's…sweet, savory, and spicy! Also, what a great tip for scoring the meat – it definitely tenderizes it AND gets rid of the tendency toward stringy-ness that flank steak can have. My favorite time-saver is to get the two pack at Costco and freeze them IN the marinade in individual gallon freezer bags. Then all you have to do is toss the bag in the fridge in the morning and it's ready for a quick grill that night! I LOVE Uncle Joe! And the rice side! We love this recipe!! It was even a favorite for my children. I got a little overzealous and we had some leftovers. So the next night I used it for fajitas. It was really yummy too. So fun to get two meals out of it. WOW…my first thought was “this was made in my kitchen? !” You MUST make the rice side-dish with this flank steak. Not only is this my first experience with this cut of beef (you made it so “do-able”) but I love cilantro and thought “why not?” when I looked at the rice recipe. Be prepared for a delectable surprise. I’m making this the next time we have company over and I’ll be sure to give you full credit! THANKS!!! This was a hit in my house! My 2 boys (6 & 9 yrs old) and husband love it. The request was made to have it once per week by the kids. It was so easy that I wouldn’t mind at all! I can’t wait to try the cilantro rice that everyone is raving about. I made this last night. We like our steak medium well but I ALWAYS overcook most things and I was determined not to this time. It turned out perfectly!! I don’t have a grill- has anyone tried in this a grill pan? Will it still work? Yep, grill pan works great! How many servings do you get from this recipe? I have a really big family (10) and I want to be sure there is plenty for everyone. Btw, you ladies are brilliant! Your recipes are divine and you’ve given me so much more confidence in the kitchen. The missionaries have even labeled me the best cook in the ward! I tell them it’s not me, but OBB that should get the credit. Keep up the wonderful work, you are making such a wonderful difference! Woo hoo! It just depends on how big your flank steak is – it does help stretch it out to cut it superduper thin. Flank can be expensive so it can add up to buy a couple, but you might just eyeball it! I did tell you think steaks, probably about 3 to 4 pounds total for my family plus Missionaries last week and we ate it all gone!